Now let’s include gas giant planets. 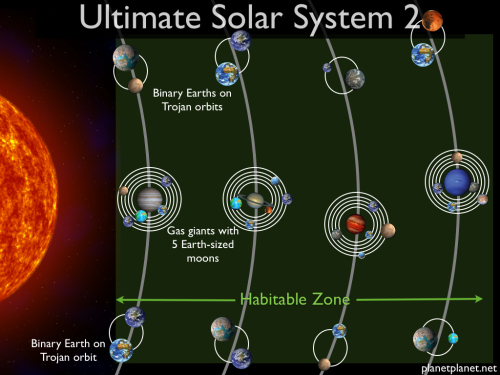 We can fit the orbits of four gas giants in the habitable zone (in 3:2 resonances). Each of those can have up to five potentially habitable moons. Plus, the orbit of each gas giant can also fit an Earth-sized planet both 60 degrees in front and 60 degrees behind the giant planet’s orbit (on Trojan orbits). Or each could be a binary Earth! What is nice about this setup is that the worlds can have any size in our chosen range. It doesn’t matter for the stability.